Cochren Foundation & Repair Company, Stoney Creek Foundation Repair Contractors - Unlike some companies in Stoney Creek who simply apply one system or technology to every foundation problem, Cochren Foundation & Repair Company customizes a proven, cost-effective and easy-to-install foundation repair system to solve your specific home foundation problems. Contact us today for an estimate in Stoney Creek. Often a foundation wall of your Stoney Creek home is damaged beyond repair and must be replaced in its entire section. When this occurs that section of the home is shored and the wall is removed and replaced with a stiffer wall engineered to suit. If your basement walls are starting to bow in or develop cracks we can provide an instant but permanent solution for your Stoney Creek home. 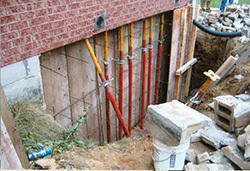 By installing earth anchors, we can stabilize and in most cases bring the foundation wall back into vertical alignment. This process takes 1 or 2 days to correct. Typically, a Stoney Creek house will initially settle from 3/4" to 1" without damage to the structure. Settlement beyond this limit will cause cracking to brick veneer/ drywall, make doors and windows difficult to open, create unevenness in the floor(s). Using a piering system, we can stabilize your Stoney Creek home and in most cases lift the home back to its original elevation. Typically a repair takes 2 or 3 days. There are a variety of foundation repair systems available in Stoney Creek to repair and stabilize a damaged foundation. We will review your specific situation and recommend a solution that will be best suited to your homes' specific needs. Contact us using our contact form or call us toll free at 1-888-610-4959 today for an estimate and get your Stoney Creek foundation repair project underway with proven professionals whom you can trust and rely on! Why Cochren Foundation is the right choice for your Stoney Creek Foundation Repair project? We'll be more the happy to answer any questions you may have about foundation repair in Stoney Creek. Contact us today find out if foundation wall repair is suitable for your Stoney Creek home.